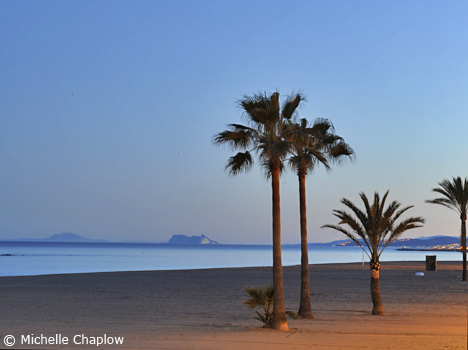 Estepona is a rare coastal destination - one of the few towns on the Costa del Sol to have retained its character and traditional feel, despite the influx of tourism in this part of Andalucia. The casco antiguo (old town) is what you'd expect from a picturesque Andalucian town - narrow, cobbled streets lined with beautiful stone houses and plazas, and walls ablaze with vibrant colour from the large variety of flora. This part of the town is truly beautiful and has the majority of tapas bars and Spanish restaurants, as well as most hostals or hostels. Estepona Marina is popular with holiday visitors during the summer months. The port is home to a number of popular restaurants and bars that have later-opening licences than those in the old town, an all round Spanish family village atmosphere. Here is a link where you will find most apartments to rent. Set just 2 minutes’ walk from the beach, Hostal La Malagueña is set in the picturesque Plaza de las Flores, which has a number of Spanish bars and restaurants. It offers rooms with air conditioning, heating and free Wi-Fi. Parking is possible nearby for an extra cost. Just 50 metres from the beach, the Hostal Las Brisas offers great value accommodation in Estepona. It has free internet access and all the rooms have a TV and private bathroom with shower. Hostal San Miguel is set in the historic centre, 200 metres from Rada Beach. The bright rooms at the guest house feature colourful, traditional décor. All include a TV and a private bathroom with free toiletries. Hotel Europa is coveniently located near the bus station, on the eastern approach to Estepona. Set 300 metres from the beach and a 10 minute walk from the beautiful old town, Hostal Europa offers rooms with free Wi-Fi. The guest house features a café-bar and a 24-hour reception. Hospederia V Centenario is an Andalucia style guest house located overlooking the village square of Cancelada (between Estepona town and Marbella) and 800m from the beach. Free Wi-Fi. Airconditioned Rooms with balconies and private bathroom. Restaurant on site. A HOSTAL (also know as a guest house) provides basic accommodation at a reasonable price with a private room. These are common in Spain and easy hard to find, with many occupying one floor of an apartment block, as opposed to a stand-alone building. Rooms don't all come with en-suite facilities, however guests will usually have the option of their own bathroom. A HOSTEL in Spain is what you would expect to find in most parts of the world - the opportunity to stay in shared dorms at a low price. These are often social hubs among travellers, with common rooms and, at times, cheap bars, making them excellent places to meet new people or find another travel companion. Many hostels also have private rooms available, as well as dorms.